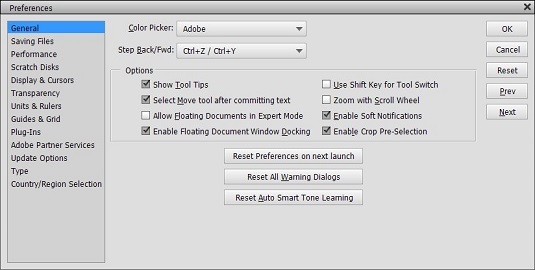 The Photo Editor’s Preferences dialog box organizes all the options into several panes. By default, when you open the Preferences dialog box in Elements 15, you see the General pane. Restore Default Settings: Clicking the Restore Default Settings button returns the dialog box to the same settings as when you opened the dialog box. The dialog box stays open for you to set new settings. Of particular importance in the General tab are the items you see for Allow Floating Documents in Expert Mode and Enable Floating Document Window Docking. Select these check boxes if you want to undock the document windows from the tabs.